Tasting Notes: Smooth floral and spice flavours. 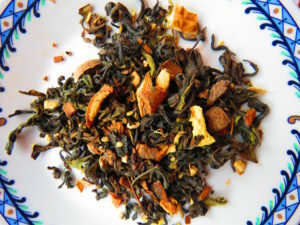 Ingredients: Oolong tea leaves, cinnamon bark, ginger root, cardamom pod, nutmeg, liquorice root, orange peel, star anise. Let this tea transport you on a sensory journey with it’s rich heady spices and wonderful oolong splendour. A rare find from Kenya, this oolong tea is meticulously crafted in small batches. Hand plucked, withered, tossed, panned, rolled and then dried, these complex processing steps result in an exquisite cup of tea. Our Kenyan teas are the only ones that are plucked, processed and shipped from small scale farmers! Pesticide free. Artisanal tea leaves – you will be amazed at the giant tea leaves steeping deliciousness in your cup. Combine these leaves with our wonderful spices and you will be whisked far away to exotic lands!